Tokenisation, is probably one of the most genuinely disruptive technologies this year, perhaps even this decade. I wanted to use this post to jot down a few of my thoughts ahead of launching my next 10 Minute Guide ???? on the topic of.. you guessed it, the blockchain, tokenisation, initial coin offerings and cryptocurrencies. I’ve been an avid supporter, spectator, and participant ever since I learned about the decentralised ledger (Whitepaper [PDF] ????) and the impact it has had (and has yet to have) on so many interactions. You also can’t ignore the drama and stories surrounding the technology (who is Satoshi, Silk Road, billion dollar fortunes made and lost overnight, etc.) – a story’s not complete without suspense, mystery and intrigue. Jumping straight in and as you would expect, the whole space has been progressing at a breakneck speed since 2008 — that’s right, we’re nearly a decade into the blockchain and cryptocurrencies. Throughout the past decade bitcoin has done an incredible job of being a reliable secure store of value (which is one of the reasons why the market cap is $150bn+). Ignoring the illegal dark-web drug superstores, gambling rings, prolific money laundering and a disregard for tax, we have learned that the underlying technology of bitcoin could be separated from the currency and used for all kinds of applications — the blockchain. At the blockchain’s heart is decentralised consensus. I’m trying my utmost not to jump into the inner workings, or get too technical in this post — purely because you’ll get bored and stop reading. So in summary, decentralised consensus and the protocol on which bitcoin, and its derivatives, are based, transfers authority and trust to a decentralised virtual network of nodes – who continuously and sequentially record transactions on a public block, creating a unique chain — ta-da ✨ the blockchain. Each successive block contains a hash, a unique fingerprint, of the previous code. Therefore, cryptography (via hash codes) is used to secure the authentication of the transaction source and removes the need for a central intermediary. The combination of cryptography and blockchain technology together ensures there is never a duplicate recording of the same transaction. Satoshi ??? ?‍♂️ — you genius. The best analogy of a blockchain is comparing it to a home address. You can publicly give out your address, but that doesn’t give any information about what your home looks like on the inside. You’ll need your private key to enter your private home, and since you have claimed that address as yours, no one else can claim the same address as theirs. Before we finish on DC — yeah, I’m going to call it that as it’s shorter than writing it all out — the most important thing is the degree of unbundling. Application and consensus logic are separate. Applications can be written to be organically decentralised. 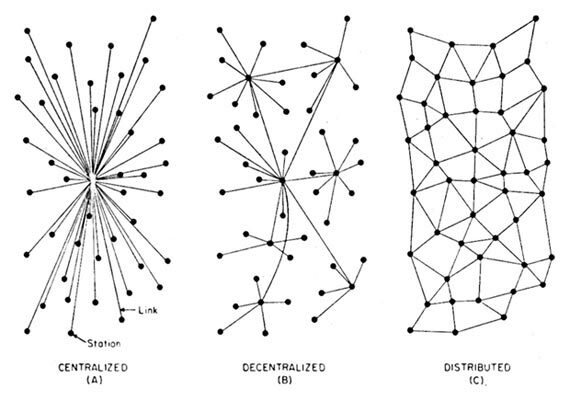 You could think of consensus as the first layer of a decentralised architecture. It is the basis for the underlying protocol that governs a blockchain’s operation. Simply put, smart contracts are the building blocks for decentralised applications. Essentially a set of rules, which participants in a contract or transaction agree too up front. These rules are embedded inside the transaction, enabling an end-to-end self managed contract between computers. Once those rules or criteria are met the contract is executed — meaning no need for central arbitration, central governance or a gatekeeper Smart properties are digital assets (or things) that know who their owners are. Their ownership is typically linked to the blockchain. Tokens exist conceptually as entries on the blockchain. You own these ‘tokens’ because you have a key that lets you create a new entry on the ledger, re-assigning the ownership to someone else. You don’t store tokens on your computer, you store the keys that let you reassign the quantity. The utility tokens mentioned above form part of the core of the blockchains, and the blockchains would not run without them. They are part of an incentive scheme to encourage people to help validate transactions and create blocks. As these are not backed by anything, they can be created by software. One cryptocurrency with such tokens is Ethereum, ETH (‘Ether’). Transactions and smart contracts need ETH to create and run, and the ETH go to the block-maker as a reward. The block-maker also gets a block reward. The core draw of generalised public blockchains like Ethereum is not purely a technical attraction, but more specifically “socio-technical”. The most disruptive aspect, thus far, for Ethereum, has been the growth of tokenised assets being created on the Ethereum public chain to create incentivised platforms; wherein the owners of the token use that asset to interact with and utilise the platform itself. Gnosis, the originator of the Reverse Dutch Auction, who raised $12million in about 12 minutes. In 2017 there has been a raft of activity in the increasingly popular ICO crypto-funding market – looking briefly at Coin Schedule, you can see that there are hundreds going live each day. ICOs are a way to raise capital for a business or open source project. They are arguably the hottest trend in blockchain and cryptocurrencies. ICOs have been likened to Kickstarter for startups. An ICO is relatively simple: use blockchain technology to issue a certain amount of tokens (or coins) sold in an auction to people paying in ether, Bitcoin or good ‘ol regular cash. Apart from rare cases (and the securitised tokens mentioned earlier), the tokens’ only ostensible function is allowing their holders to use the platform that issued them: they could be converted into special objects on a gaming platform. They are the equivalent of coupons for a supermarket under construction. The tokens are liquid and tradeable from day one. The reason they have gained so much interest and attracted so much money is due to speculation. If you back the right supermarket, over time its own mini currency will flourish, and those who bought in early will reap the rewards. Taking a step back, and looking at that $160bn market cap for cryptocurrencies – there are a lot of people who have made fortunes. Remember that famous 10,000 bitcoin pizza? That pizza is now worth $40m. As a result there is a lot of wealth that people have concentrated in bitcoin, ICOs provide a diversification strategy. Although this post has been focused on utility tokens I think it’s obvious that securitised tokens will see huge growth simply due to the efficiencies they provide in transactions. Of course with the uptick in use we’ll see the regulation not too far behind, we’ve already seen the SEC release a warning note on ICOs. We’re starting to see the technology adopted by mainstream huge finance corporations; see – $11 Trillion Bet: DTCC to Process Derivatives With Blockchain Tech. For the utility tokens, I think we’ll see ICOs being locked into an escrow mechanism. Giving limited access to cash immediately and only releasing the rest after milestones have been reached, this helps prevent some of the things we have seen over the past few months. I’m excited about the future of tokens, ICOs and cryptocurrencies generally. There are so many insanely smart people focused on this space. Furthermore, there are a plethora of genuine use cases where this technology improves what came before it. We have to allow it to progress through this “finding its feet” stage; where, no doubt fortunes will be lost. We have to give the first batch of ICOs enough time to develop and flourish. We will see what happened to the failures, learn, and reiterate. If you’re a startup founder with a genuine use-case for tokens within your platform, an ICO could prove to be a relatively fast method to raise funding. Be aware of the legalities, most certainly consult a lawyer and adhere to best practices. Ensure this industry and technology gets the good press it deserves. It’s going to be exciting to watch! Next PostStartup founders, is your CAC under control?